Train travel in Myanmar . . . The railroad to Mandalay. A train from Lashio to Mandalay crosses the famous Gokteik Viaduct in Shan state, northern Burma, in early 2018. Photo courtesy of Vincent Ho. Burma is not noted for the attractiveness of its regime, to put it mildly, but things are improving. www.burmacampaign.org.uk used to tell tourists not to go to Burma at all, but it changed this advice in 2012. You'll find Burma a fascinating country which is easy and safe to visit, with friendly and honest people. Paradoxically, the lack of mass tourism due to the boycott of the regime has preserved Burma from westernisation, making it one of the most interesting places to visit now, before it's too late. Burma's British-built railways are less developed than others in Southeast Asia, but you'll find the trains are a wonderful way to get around and experience the country at ground level, avoiding unnecessary domestic flights and cramped buses. The journeys are as much an adventure as the country itself. What are Burmese trains like? Is it Myanmar or Burma? Myanmar is the Burmese-language name for Burma, and always was, even in colonial times. Burma is the English-language name for Myanmar, and still is. The Burmese government switched to using the Burmese-language name for the country in 1948, and in 1989 also switched to using the Burmese-language names for a number of places around the country. On this webpage, the Burmese names are used first, with the familiar English-language name in brackets, for example Yangon (Rangoon) or Mawlamyine (Moulmein). Overland travel between Burma & India or Burma & China is difficult or impossible, due to civil unrest in border regions and/or areas where travel by foreigners is restricted or prohibited. 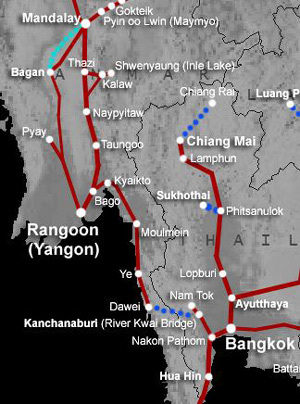 However, overland travel between Burma & Thailand is now possible via at several border crossings. 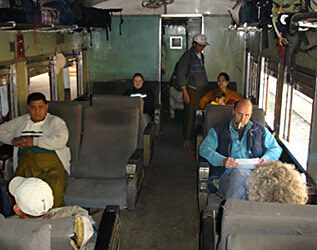 For details of how to travel overland between Bangkok and Burma click here. The Burmese Railways don't have a website, and this page is kept up to date by feedback from travellers. If you find that fares or times have changed, or can fill gaps in the information, please email me. If you find times or prices have changed from those shown on this page, a photo of the fare & timetable boards at the station would be much appreciated! Credit cards and travellers' cheques are NOT accepted in Burma. Local currency is Kyat (pronounced 'chat'), £1 = approx 1,900 kyat, $1 = approx 1,500 kyat. The Rangoon to Mandalay express trains are a pretty comfortable and in fact relatively fast and punctual option for travel between these cities. Pretty bumpy in places, that's true, but much more comfortable than cramped buses and infinitely more of a genuine Burmese experience than any flight. 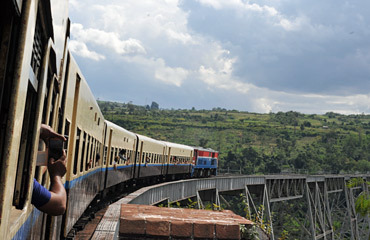 In fact, the train ride is a highly recommended experience, over the old British-built colonial railway. 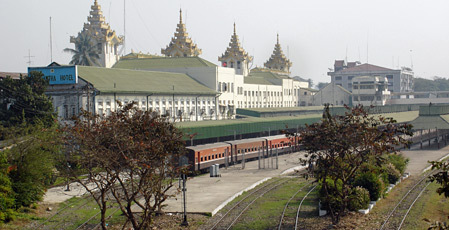 Most Rangoon-Mandalay trains were rescheduled to run by day rather than overnight in 2006 when the government moved the capital to Naypyitaw, but switched back to being mostly overnight in January 2012. The timetable below is current as at 2016, beware of a number of Burmese websites showing out-of-date timetables.
? = Estimated time. How to buy tickets at the station. Order tickets online in advance. All these trains run every day. Rangoon to Mandalay is 622 km (388 miles). Rangoon to Naypyitaw is 372 km (233 miles). Rangoon to Thazi is 493 km (308 miles). Train 5/6 is composed of new Chinese coaches delivered in January 2016, although there is now no sleeper on this train. Train 9/10 runs to/from Kalaw & Shwenyaung becoming train 143/144, see below. It's a slow train, and isn't always shown on station timetable boards. Train 5/6 now uses new Chinese coaches delivered in January 2016 in this special green & blue colour scheme. The new train has 9 ordinary class cars & 3 upper class cars, all with air suspension for a better ride, but there's no sleeper. 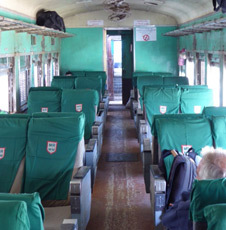 Upper class cars on a Rangoon to Mandalay express are actually quite comfortable, the lack of air-conditioning is almost an advantage because windows open for a cool breeze and unrivalled views of the Burmese countryside. See this news item at www.mmtimes.com. If you want a sleeper, you'll need to use train 3 or 4, see the sleeper photos Photos courtesy of Lindsay Stubbs. Children under 3 years old travel free, children under 10 pay half fare. £1 = approx 1,900 kyat, $1 = approx 1,500 kyat. If you can help fill the gaps in this table, please email me! To buy tickets in Rangoon, go to the advance booking office in Bogyoke Aung San Road as explained here. You want the first ticket window on the left for tickets to Mandalay. To buy tickets on the day of departure, go to the station ticket office. Contrary to what you might read in your guidebook, the Rangoon to Mandalay express trains are a comfortable, fairly fast and reasonably punctual way to travel between Rangoon and Mandalay. 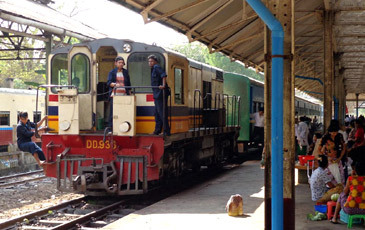 Trains are available for boarding at Rangoon in good time (normally at the platform right in front of you when you enter the station), and they generally depart promptly with whistles blown, flags waved, and a long low hoot from the locomotive. The train trundles out of Rangoon at just 15mph with the local children trying to hang on to the outside, accelerating to 40-45mph once clear of the city, clickety-clacking past small villages of palm-thatched cottages built on stilts, ox carts trundling slowly along dusty roads, and occasional white or gold stupas. 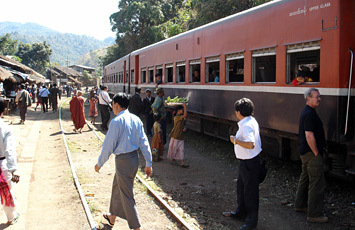 Burmese children love to wave at trains, especially if they see a western face at the window, and will smile broadly when you wave back. You'll be travelling along a railway originally built by the British - look out for the old-fashioned semaphore signals and mock-Tudor signal boxes at Bago. Even when night falls, you'll see the palm trees silhouetted in the moonlight, and the smell of the village cooking fires will drift into your sleeper compartment through the open window. Make sure you have a jumper or fleece handy if you travel overnight, as it can get very cold a few hours after dark. The track is not the best in the world and in places it will put your carriage suspension through its paces, but you stand a good chance of arriving at the other end within 5 or 10 minutes of the advertised time. However, delays of 30 - 60 minutes or more are not uncommon, so make allowances. Traveller Chris Nowakowski reports, 2017: "I took the sleeper from Mandalay to Yangon, train #4. I purchased my ticket from an agency a few days prior to travel. initially they told me a sleeper was not running, but then replied it was indeed operational. Two brits and I were the only foreigners on board. We shared a sleeper and pulled out precisely at 5pm. I enjoyed dinner (choice of fried rice, fried noodles or "sweet and sour") and breakfast (omelette with white bread and tea) in the dining car. It was indeed a bumpy ride, but nothing to the degree people seemed to hype it online and in the guidebooks. I managed 7 hours of on and off sleep and we rolled in about 30 minutes late of our scheduled 745am arrival. I was quite happy to have taken the trip and glad I ignored the ‘advice’ of many others." Traveller Roger Minns reports: "After a last shower we set off on the midday walk to the station and our rendezvous with our upper class seats of the ’Chinese 29 up train’ from Rangoon bound for Mandalay leaving at 12.30 [this particular train no longer runs]. And there it was! A spacious carriage with collapsed but still surprisingly comfortable seats (albeit in the permanently fully-reclined mode) some 40 years old but mercifully with windows which opened fully and a ceiling full of fans which worked! The carriage was full with polite local people including a couple of monks. We left on time through the outskirts of Rangoon and then through an arid farming area. 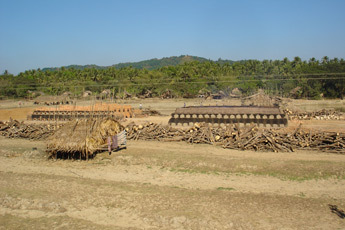 People working on the land with oxen but no tractors or farm equipment – unbelievably arduous work. 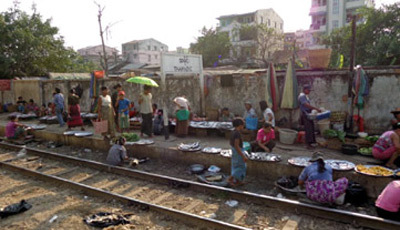 Occasionally our train slowed or stopped at a station when a multitude of vendors would get on – often emerging from the roof with a range of hot and cold food offerings – including, to Tom’s undisguised delight, a bloke with tins of coldish Myanmar beer. There was also a restaurant service of sorts on board and Graham in particular took full advantage of the supply of noodles, curries and, inevitably, coffee. After dark the lights didn’t really work so we tried to sleep in fairly uncomfortable circumstances. It was chilly, but with the windows closed not excessively so, and we all managed to kip for a bit. Any urge Tom and I might have had to visit the loo rapidly evaporated when a rather shaken-looking Graham returned with a report that there was a loose turd rolling around on the lavatory floor! Then, suddenly at 3am, our arrival on time at Mandalay Station! We had worried about arriving at Mandalay at 3 in the morning expecting the place to be dead. Far from it! The station was humming with music, tea houses, people sleeping on the platform and, inevitably, taxi drivers! " ...you can smell the village fires. ...there's even the odd golden stupa. Bagan, where 800-year-old temples and stupas litter a huge plain as far as the eye can see, should not be missed, and it's a highlight on most visitors' itineraries. 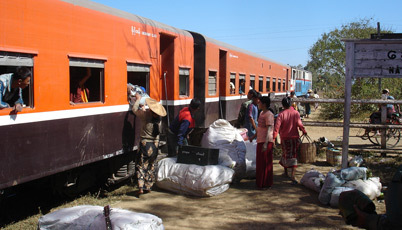 There is a daily direct train from Rangoon to Bagan introduced in early 2010, with a sleeping-car, see the photos below. Expect a bit of a bumpy ride, but a real adventure, across Burma on a sleeper train passing occasional golden stupas with the smell of the village fire wafting in on the cool breeze through your open window. 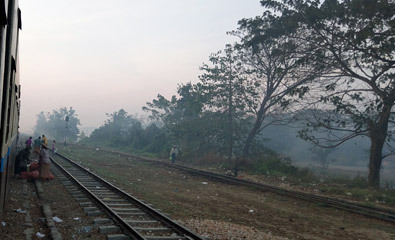 For an account of a journey on this train with photos, see http://lesleyleephotography.com/myanmar-by-train. Alternatively, you could take an express train from Rangoon to Mandalay, visit Mandalay, then travel to Bagan using the express ferry, a wonderful journey. Here are the details for the direct train. Feedback always appreciated! S = upper class sleeping-car (not in rainy season); U = upper class seats (not in rainy season); 2 = 2nd class seats; O = ordinary class seats. Order tickets online in advance. How to buy tickets at the station. What are Burmese trains like? This train should have a restaurant car, but sometimes doesn't, so always take your own picnic & supplies of beer. Expect an arrival an hour or two late. There's just one sleeping-car, which may be of the Special type or the Standard type. Some travellers on this train report a special sleeper, others a standard sleeper. If it's a special sleeper there's no access through the train, so again make sure you carry your own picnic, water and beer. There's a 25,000 kyat entrance fee for foreigners visiting the Bagan area. 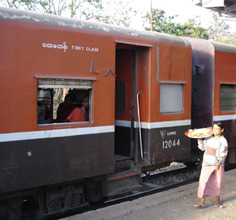 * This train by-passes Pyay, but passes very close to it, calling at Shwedagar station only 4 miles from central Pyay. IMPORTANT UPDATE : For the rainy season June-October when there are few tourists, this train temporarily ran without its upper class sleeping-car & seats car, although some reports suggested that they still added the sleeper if there were more than 8 bookings. The sleeper & upper class car should have resumed running as normal in late October, but more recent reports suggest that they are still only adding the sleeper when there are more than 8 bookings. 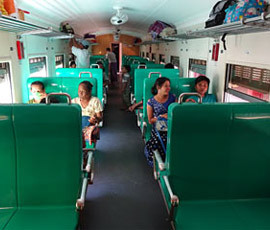 This train now appears unique in offering 'second class', not previously offered on any Burmese train. 2nd class is similar to Ordinary class, but with a bit extra padding. Feedback or photos would be appreciated. £1 = approx 1,900 kyat, $1 = approx 1,500 kyat. To buy tickets in advance from outside Burma, see the How to Buy Tickets section below. To buy tickets in Rangoon, go to the advance booking office in Bogyoke Aung San Road as explained here. 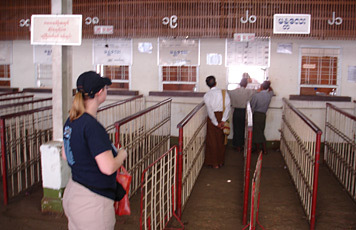 You want the first ticket window on the left for tickets to Bagan. To buy tickets on the day of departure, go to the station ticket office. To buy tickets in Bagan: You now need to go to the station unless you can find a travel agency willing to do this for you. 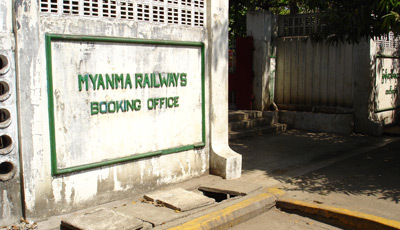 It's reported that the former Myanmar Railways ticket office in Nyaung Oo, on Lanmadaw street, next to the Grand Empire Hotel has now closed down. Bagan station is a modern pagoda-style station in the middle of nowhere about 5km southeast of the Nyaung Oo township, roughly 9km from Old Bagan. It's possibly one of the few stations in the world further from the town it serves than the airport! One traveller reports, "I caught the train up to Bagan from Yangon with my family last week. It was a great journey – extremely bumpy in some sections but altogether a very enjoyable experience. We arrived 2 hours late at 11:30, exactly as we'd been advised by the conductor the night before, so it may be down to work on the line..." There should be a restaurant car attached to this train, but take your own supplies just in case there's not. Traveller Andy Griffiths reports from a trip in 2018: "Just travelled on the overnight sleeper. What an experience. The train rolled out on time. We 4 had a first class sleeper. Pre-ordered dinner with beer which was delivered through the open window at the station closest to 7. Beer was cold and the rice and chicken were hot. Shame there was no cutlery to eat with and we didn't have a bottle opener! However we overcame both potential disasters. The train ride was certainly third world, we rocked and rolled through the beautiful countryside. The toilet was fine but the sink emptied onto the floor - incorrect hose size that couldn't be fixed. Night came and so did the cold - take warm clothes! We received further life-saving beer around 8 then retired to our bunks about 9.30. Some of us enjoyed the rock and roll but others were constantly woken by the bangs. We were greeted by a magnificent sunrise and at 7 our breakfast omelette, bread and coffee arrived. And good it was too, cutlery included this time. We arrived all to soon in Bagan - seemingly on time." Sleeper on the Yangon to Bagan train. Courtesy Eckart Spindler. The Bagan to Yangon train being shunted into the platform at Bagan. Courtesy of Eckart Spindler. The restaurant car. Courtesy of Eckart Spindler. 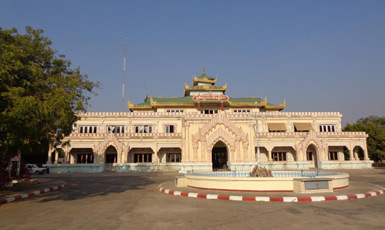 Bagan railway station. Courtesy of Eckart Spindler. 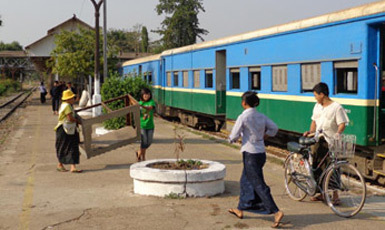 The train from Yangon arrived at Bagan station. Courtesy of Steve Mason. Sunset over the Irrawaddy, from the highly-recommended Bagan Thande Hotel. * Leaves Rangoon the previous day as train number 9 and has no sleepers, see mainline timetable above. It's better to travel with a change at Thazi, as recommended below. 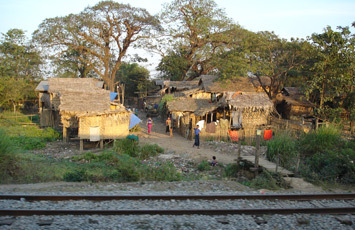 ** Arrives Rangoon the day after leaving Shwenyaung as train number 10, and has no sleepers. You may prefer to change at Thazi, as recommended below. Thazi to Kalaw is 197km (123 miles), Thazi to Shwenyaung is 247km (154 miles). All the trains shown here run daily. The Moonlight guest house in Thazi is clean & simple with great food, singles with fan $10, doubles $15. 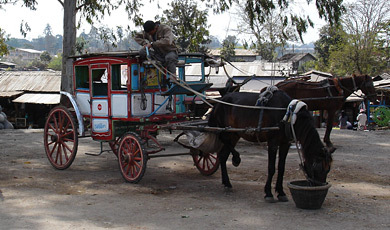 It's 15 minutes walk or short (horse-powered) taxi ride along the road from the station into town, and you'll normally find rooms available without any advance reservation. They are used to people leaving early for the trains and can make a breakfast bag for you to take. On arrival at Shwenyaung station, walk 15 minutes (or take a taxi, 1,000 Kyat) along the main road to the Tuk Tuk stop for Nyaungshwe. A Tuk Tuk directly from the railway station to any hotel in downtown Nyaungshwe costs 8,000 Kyat per car. There's a 15,000 kyat entrance fee for foreigners for the Inle Lake region which is paid at a toll booth on the road from Shwenyaung to Nyaungshwe. If you're visiting Nyaungshwe during the high season, make sure you reserve accommodation as soon as you can and to confirm it a week before you arrive, as hotels and guesthouses can sell out. Feedback appreciated. How to buy tickets Children under 3 years old travel free, children under 10 pay half fare. Buses may be faster, but the Slow Train From Thazi is a wonderful experience which should not be missed. Stock up on mineral water and beer, then recline in your Upper class armchair (you may have no choice - the recline mechanism may be broken), and gaze through wide open windows at the wonderful scenery passing by at just 15-20 mph. 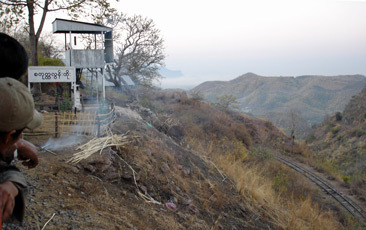 After crossing the plain from Thazi, the train enters the hills and climbs up a steep mountainside on a series of switchbacks, reversing several times and backing up the slope to gain height. In several places, the train loops around and doubles back on itself. 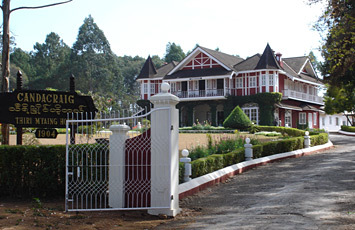 Look out for the very English mock-Tudor station building at the old British hill station of Kalaw. 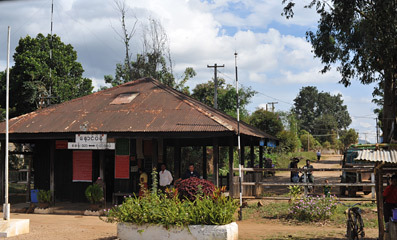 When you arrive in Shwenyaung, the journey to Nyaungshwe takes 25 minutes by taxi or public pick-up. Check out this blog: http://asocialnomad.com/2015/09/29/slow-train-thazi. 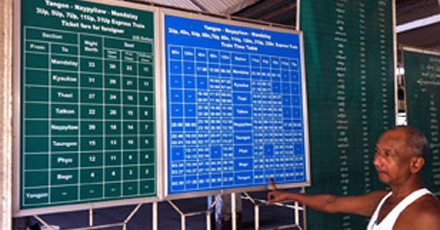 Rangoon or Mandalay to Inle Lake: Take an express train from Rangoon to Thazi, see the Rangoon - Mandalay timetable above. One option is to travel the day before and stay the night in Thazi, there are guesthouses at the end of the station approach on the main street. You are unlikely to have any difficulty buying a ticket for the Slow Train to Shwenyaung at Thazi ticket office when you get there. In Thazi, the Red Star restaurant, where the station approach joins the main road, is a good choice for a meal while you change trains. A deluxe waiting room for foreigners is also available at Thazi station for $1 per person. Complete the last few kilometres from Shwenyaung to Nyaungshwe by bus or taxi. Inle Lake to Rangoon or Mandalay: In Nyaungshwe, there are lots of travel agencies who can arrange just about anything except train tickets! But don't worry - just turn up at Shwenyaung station 30-40 minutes before the departure of the Slow Train To Thazi and you're unlikely to have any difficulty getting an Upper class ticket for the train to Thazi. For onwards trains from Thazi to Rangoon or Mandalay, see the Rangoon - Mandalay timetable above. You can buy a ticket for one of the expresses to Rangoon when you get to Thazi. The train from Shwenyaung to Thazi will probably arrive in Thazi either on time or even 15 minutes early(!). If you change onto an express, these get priority so you can expect an arrival Rangoon either on time or maybe 20-75 minutes late. In Thazi, the Red Star restaurant, where the station approach joins the main road, is a good choice for a meal while you change trains. A deluxe waiting room for foreigners is available at Thazi station for $1 per person. The Shwenyaung-Thazi train. Courtesy Sebastien Santurette. Into the hills... The Slow Train to Thazi winds its way through the hills. 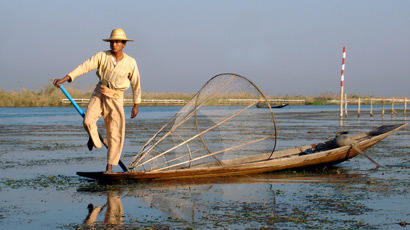 Local fisherman on Inle Lake. 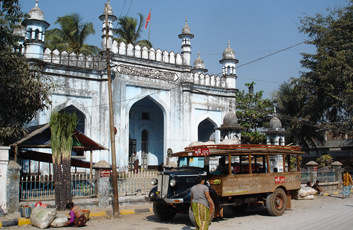 Moulmein is not on every visitor's itinerary, but if you have the time it's well worth a visit for its colonial buildings and historic mosques. Rudyard Kipling wrote the Road to Mandalay, but Moulmein was the only Burmese city which he actually visited, and the main pagoda on the ridge overlooking the city is the setting for his poem Burma Girl. Kyaikto is the stop for the famous Kyaiktiyo Pagoda. For overland travel between Dawei & Kanchanaburi & Bangkok in Thailand, see here. If you're travelling to or from Dawei, you need to switch trains at Ye. This is a simple cross-platform switch. 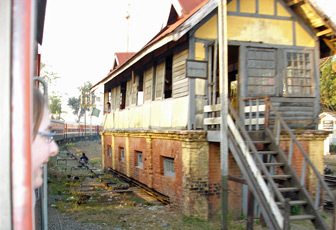 Trains used to terminate at Moatama for a ferry across the Thanlwin river to Moulmein, but the new road+rail bridge and new railway station in Moulmein opened to trains on 18 April 2006. Trains from Rangoon now run beyond Moatama across the new bridge direct to and from Moulmein itself and one runs on to Ye and Dawei as shown. The new station is behind the ridge with the pagodas. Rangoon to Moulmein is 281 km (176 miles). All the trains shown here run daily except the one marked *. * This is the fare for train 35/36. Other trains are 4,250 kyat. The train follows the Rangoon-Mandalay main line as far as Bago, where it branches off and heads across the plains to the broad Sittung River which it crosses via a huge and heavily-guarded road/rail bridge. The scenery becomes more interesting on the other side - look out for primitive brickworks on the left in several locations, with brick kilns and bricks drying in the sun, and of course you'll see lots of stupas especially on the mountain ridge to the east. Historically, the railway from Rangoon ended at Moatama (Martaban) which was the ferry terminal for ferries across the Thanlwin River to Moulmein itself. A new road+rail bridge has now been built, opened to road traffic in February 2005 and to trains in April 2006. Trains now rumble slowly across the bridge into a brand-new station behind the hill with Moulmein pagoda. 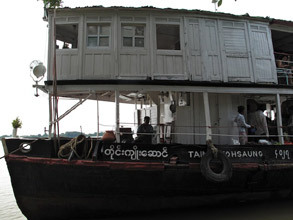 The Moatama-Moulmein ferry service has been discontinued. Expect an arrival generally around 30-60 minutes late. 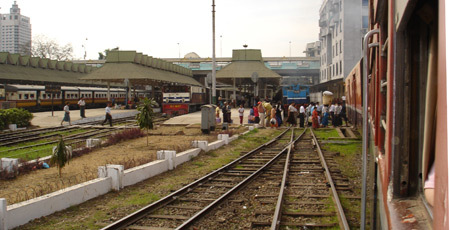 Moulmein railway station - see map. It was under construction when I saw it in 2005! Courtesy of D J Capells. 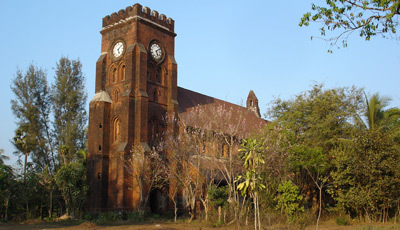 The old British church at Moulmein. Travelling between Moulmein & Dawei you must switch trains at Ye, even though it's shown as a direct train... Courtesy of Alistair Weaver. Parts of the line between Ye & Dawei are almost covered by jungle! Courtesy of Alistair Weaver. Sunrise seen from the early morning Dawei to Ye train. Courtesy of Alistair Weaver. Rangoon to Pyay is 257 km (161 miles). All the trains shown here run daily. How to buy tickets. What are Burmese trains like? Traveller Daniel Byrne reports: "We purchased tickets at Pyay Central Station, near the Aung San statue, on the same day as departure. We tried to buy them at about 11am but were told the ticket office didn't open until 3pm. There was only Upper and Ordinary class. The train arrived around 11pm for an 11:30pm departure. We were told when we bought the ticket that the train would arrive at Yangon Central Station at 8am and that was almost spot on (between 8 and 8:30). We had heard a lot about delays but everything was very punctual in our experience (though it is the dry season). The ride was very bumpy, but we managed a bit of sleep. There were toilets on board (squat only), and vendors came on board at most stops with some kind of food. The was no food available on board." Pyin Oo Lwin, also known as Maymyo after its founder Colonel May, is well worth a visit for the colonial buildings, its botanic gardens, and a ride in the miniature stagecoaches that are used as taxis. 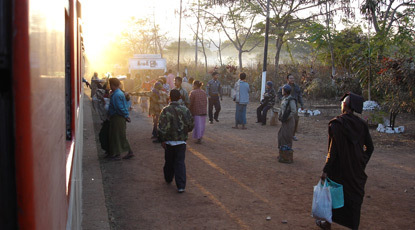 Many visitors also head off to the market towns of Shan state such as Hsipaw. 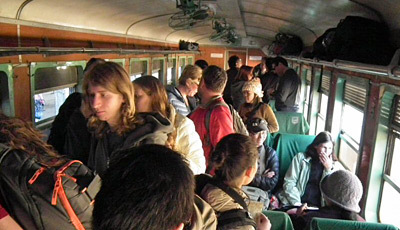 The early-morning train ride from Mandalay up into the hills is a fabulous experience, see the description below. 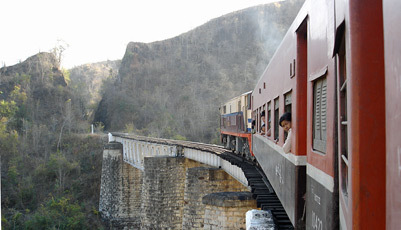 South of Hsipaw, the train crosses the famous Gokteik viaduct, a historic landmark in its own right. U = upper class seats 1 = first class seats O = ordinary class seats. Map of train routes in Southeast Asia The train runs daily. Mandalay to Pyin Oo Lwin is 67 km (42 miles). Mandalay to Hsipaw is 206km (129 miles). Mandalay to Lashio is 280 km (175 miles). Don't let the early start put you off, the ride into the hills as dawn breaks is absolutely fabulous... It's an early start from Mandalay, but this train ride is easily the best way to reach the old British hill station of Pyin Oo Lwin (Maymyo) and the Shan state towns of Hsipaw (Thibaw) and Lashio. Leaving Mandalay heading south the train soon turns northeast across the plains. It's still dark at this time, but traders with torches and fires flock to the train when it calls at wayside stations. At dawn, the train reaches the foot of the mountains and starts climbing. It gains height using a series of zig-zags, stopping and reversing up the steep gradient twice to reach the plateau at the top of the escarpment (see the picture below). 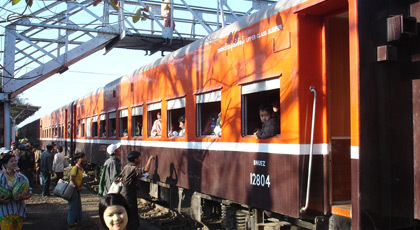 Soon after reaching the plateau, the train arrives at Pyin Oo Lwin. After Pyin Oo Lwin the train snakes its way through pleasant countryside to the highlight of the trip, the crossing of a spectacular valley on the dramatic Gokteik viaduct, just after Gokteik station. You'll see the viaduct on the left-hand side of the train as you leave Gokteik station, The train then curves left onto the bridge. The Gokteik viaduct was built in 1901 by an American firm of contractors who won the tender with a design allegedly far more advanced than any of the other bids. When built, it had the highest span of any bridge in the British Empire, and was the only American-built bridge in the Empire, too. Rumour has it that the Burmese government did no maintenance on the bridge whilst a British insurance policy was still in force, but you'll be relieved to hear that the bridge was renovated in the 1990s. 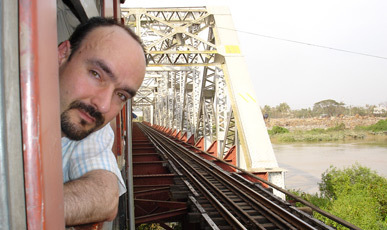 The train passes over at walking pace, and you may be prevented from taking photographs as the Burmese consider the bridge to be of strategic importance. Don't lean out of the window and look downwards if you suffer from vertigo! Expect an arrival at the other end around 15-60 minutes late. How to do a day trip from Mandalay over the famous Gokteik viaduct: Gokteik station is on the Mandalay side of the famous Gokteik viaduct, in other words, coming from Mandalay or Pyin Oo Lwin, the train arrives at Gokteik station before crossing the viaduct. If you want to cross the viaduct on the train and immediately return south, you should buy a ticket to the station beyond Gokteik, a little place called Nawngpeng, see the timetable above. This is where the northbound and southbound trains pass each other on the single line, so you can go from Mandalay or Pyin Oo Lwin to the viaduct and back in a day. Make sure you're ready to jump off the northbound train and onto the southbound train on the adjacent track, as if the northbound train is late and the southbound already waiting, it will leave as soon as the northbound train arrives and it gets the 'right away'. 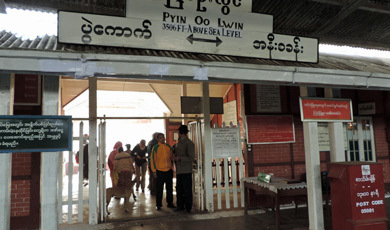 You won't have time to buy a ticket at Nawngpeng station, just jump onto the southbound train back to Pyin Oo Lwin or Mandalay and pay on board. 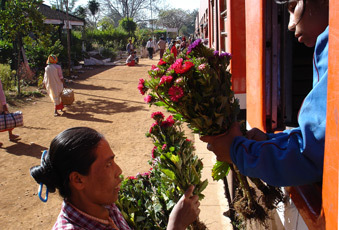 Traders flock to the train - some stations on this line seem to specialise in fresh flowers! ...wooden seats in ordinary class. Cheap & fun. ...on switchbacks up into the hills to Maymyo! Pyin Oo Lwin station... Courtesy of Ian Moffat. Onwards to Gokteik, Hsipaw & Lashio. These are upper class seats... Photos courtesy of Richard Herring. The Gokteik viaduct... Beyond Pyin oo Lwin, the highlight of the journey to Lashio is the crossing of the famous Gokteik Viaduct across a deep river gorge covered with thick bush. When built in 1901, it had the highest span of any bridge in the British Empire. Above, a view of the viaduct seen from the northbound train soon after it leaves Gokteik station on its way towards the bridge. Photo courtesy of Richard Herring. Watch the Gokteik video. Gokteik station, located a few minutes before the viaduct on the southern side. Gokteik & Nawngpeng station photos are courtesy of Vincent Ho. Nawnpeng station, beyond the viaduct on the north side. Northbound & southbound trains cross here, if taking a day trip from Mandalay you switch trains & return south here. A southbound train crossing the Gokteik viaduct in early 2018. Courtesy of Vincent Ho. Traveller Jerome Luepkes reports: "I took the train from Hsipaw to Pyin Oo Lwin, the downhill journey on the Lashio line, an eventful journey of 7 hours through some of the best scenery in Burma. You could have a leisurely breakfast at the hotel, then hop on the train for a day of sights and sensations, arriving at the other end with plenty of daylight left to check into your hotel. 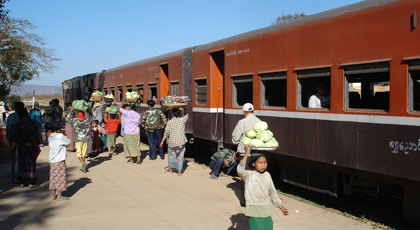 The trains are usually fairly punctual, but no one actually expects everything to be perfectly on time anyway, a typical characteristic of life in Burma. My train was delayed by forty minutes, so I had plenty of time to sample the tasty food the local vendors had on offer at the station. When the train arrived there was plenty of time to find seats and settle in. The trains are old Chinese carriages, built for a different gauge to the tracks in Burma. This results in an awe-inspiring amount of sideways movement as the train accelerates out of the station and through the hills. There is so much swing that passengers have to hold on for dear life as they move about the carriage, but it's all in good fun. The seats of the "Upper Class" are the softest and widest on the train, but that's about all the difference, as the whole train is fairly old and dirty. A lot of the fixtures were broken as well, but that didn't diminish the experience for me one bit. I loved the entire train trip as it gave me a chance to talk to the locals, meet other travellers, and have a truly Burmese experience. We stopped several times along the way, each stop affording the chance to get onto the platform for a while, buy some food and a cup of tea while taking photos of the smiley Burmese people. The highlight of the trip was the spectacularly colossal Gokteik Viaduct which we passed over in the early afternoon. All the doors of the train can be opened at any time, and budding photographers were busy taking photos out of the carriages the whole way over. The scenery continued to be breathtaking all the way into the afternoon. Arriving at Pyin Oo Lwin was both a relief after a physically demanding trip, but also the end to an epic and highly enjoyable train journey." All trains take one night. S = upper class sleeping-car U = upper class seats O = ordinary class seats. Trains 41, 55 & 56 have a sleeping-car, also probably 42. Feedback appreciated. Mandalay to Myitkyina is 539 km (337 miles). Hopin is the station for Indawgyi Lake, pick-ups meet the train will take passengers to Longton on the lake (2-5 hours, 4,000 kyat). Naba is the station for Katha, minivans meet trains & will take you to Katha. Feedback or photos of the timetable boards would be much appreciated. Views from train 33 from Mandalay to Kawlin & Myitkyina. Photos courtesy of Stefan Baltus. 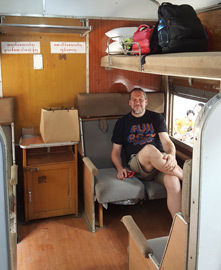 Traveller Alistair Weaver travelled in 2015: "We booked our Upper Class Sleeper tickets to Hopin at Mandalay station the day before we travelled and had no problems. It cost 17,900kyat per person for Upper Class Sleeper. 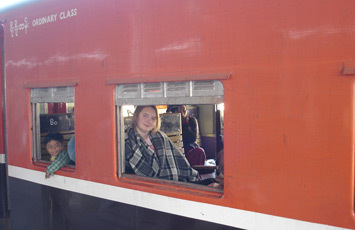 The train arrived 2 hours late and although tired and worn it was clean and we had the compartment of 4 to the 3 of us. The journey is a memorable one but at times the ride can be quite bouncy but it is a great way to see parts of Burma you'd never see. 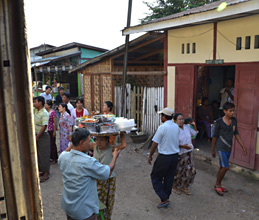 There's no restaurant car onboard but food can be purchased from stations with most people buying their food at Shwebo, which is about 4 hours into the journey. We were worried that we would have an early start as we were due to arrive in Hopin at 03:00, however the train ran late arriving at 08:30. This appears to be a regular occurrence. There were plenty of opportunities to buy breakfast before we arrived at Hopin. Once at Hopin we were met by a pick up truck driver who drove us, various suppliers and some other passengers to Longton for 4,000kyat. There is only one very basic guest house to stay in in Longton (IndawMaHar Guesthouse) which currently doesn't have any mains electricity although a few restaurants on the road nearby will charge devices for 500kyat. Whilst very long the journey was a fantastic experience and I'd recommend it to anyone with an adventurous streak." 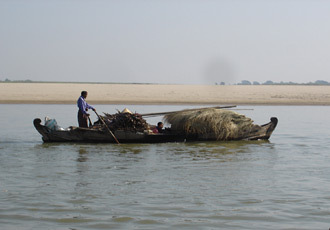 Alistair Weaver also describes the return trip, partly by river boat: "The one Guest House in Longton Village on the shores of Indawgyi lake will arrange transport back to Hopin for you. The pick ups usually leave about 07:00 and cost 4,000kyat per person. The journey is quicker as there is less to pick up/drop off and takes 2-3 hours. The first southbound train is at 12:00 which takes 4-5 hours to reach Hopin. We purchased tickets on the day and got reserved seats in Ordinary Class which was more than suitable for the short trip. Once at Katha we got a minivan to Katha for 1,000kyat which took an hour. There are plenty to choose from. Our minivan dropped us outside Ayarwaddy Guest House in Katha which is opposite the two jettys. For people going south there are two options: There is a daily Fast Boat from Katha to Mandalay which takes roughly 14 hours, departing at 5am. This can be booked at the green shack to the right of the guest house and costs 25,000 kyat. This also stops at Kyauk Myaung. There is also a slow boat operated by the state IWT (Inland Water Transport). This leaves on Monday, Wednesday and Friday at 17:00. A bunk in a twin cabin (you can travel as a lone traveller) costs $45 (they also accept kyat), whereas a space on deck costs $9. We did the trip in May, which is the end of dry season so suspect it was when the river is lowest and the boats are slowest. The trip to Kyauk Myaung took 24 hours arriving at 17:00 the following evening. The trip to Mandalay took 43 hours, arriving at 12:00. The $9 option is a great experience to mingle with the locals and you can buy supplies such as a mat (2,500 kyat) and pillow (1,000kyat) in Katha before you sail. Try and get a space in the middle of the boat away from the engine at the back and far enough in to be dry should it rain. There is a basic food stand onboard that sells rice and egg in the morning (500kyat) and a meat curry with rice in the afternoon and evening (1,000kyat). The boat doesn't travel when it is dark, at least in dry season, to prevent it grounding so its possible to get a good nights sleep. As with most of Asia people board the ferry at stops selling food. According to the IWT website, the return working for the boat from Mandalay leaves at 06:00 on Monday, Thursday and Friday but it is probably best to travel with the flow of the river. This is the train service between Mandalay and the temples of Bagan, although you may prefer the river journey aboard the Mandalay-Bagan express ferry service. Mandalay to Bagan is just 179km, making this a very slow train, even though the line was only built in 1996! But the sleeper does save time and a hotel bill! S = sleeper class U = Upper class seats 1 = First class seats O = ordinary class seats How to buy tickets What are the trains like? Train 117/118 consists of passenger-carrying freight cars equipped with benches - used by local farmers to transport their produce. Train 119/120 used to be a Japanese diesel railcar, without any sleeper. From late 2018 it is a regular locomotive-hauled train with a sleeping-car of the regular side-corridor type. Bagan station is a modern pagoda-style station in the middle of nowhere about 5km southeast of the Nyaung Oo township, 9km from Old Bagan. It's possibly one of the few stations in the world further from the town it serves than the airport! The station does, however, feature a spacious if spartan 'tourist lounge' in which to wait. Mandalay to Bagan is 179 km (112 miles). Foreigners no longer pay the higher-rate fares in US$ shown above, but pay the same fares as Burmese citizens, in local currency (kyat). On the premier Rangoon to Mandalay route, the express trains are reasonably clean, comfortable and even relatively speedy. 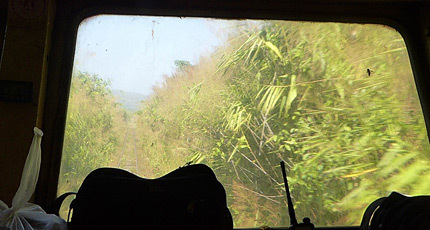 On other routes, don't expect western standards, as train travel in Burma is an adventure! Trains are often wonderfully slow, grubby, and fittings such as lights and seats are usually not in the best state of repair. But best of all, the glass panes and metal shutters over the windows are normally secured out of the way, giving you a clear and unobstructed view of the countryside and villages of 'real' Burma as it trundles past, with nothing between you and it! 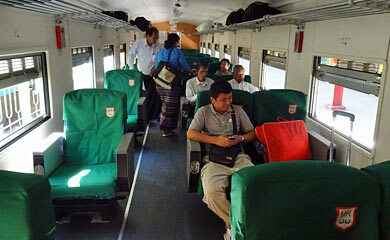 Burmese trains have three classes: Upper class, First class and Ordinary class. 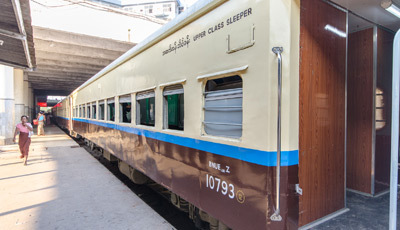 In addition, Upper Class sleeping-cars operate on several Rangoon to Mandalay trains, on the Rangoon to Bagan overnight train, and in some Mandalay-Myitkyina trains, and they come in two types, standard sleepers and special sleepers, details shown below. 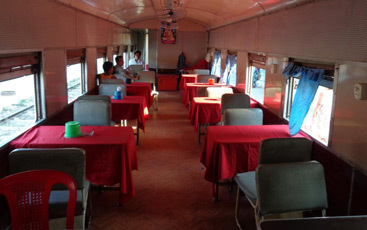 The best Rangoon-Mandalay trains have restaurant cars, with 4-seat tables, serving meals, drinks and snacks. 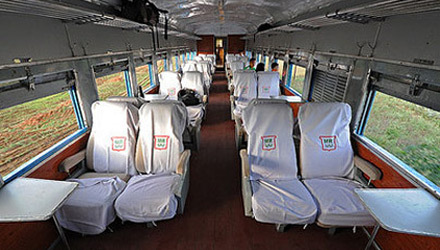 Upper class seats on express trains, as on the Rangoon-Mandalay expresses and the Rangoon-Bagan train. The windows have a glass pane & a metal shutter, but both can be secured out of the way. Courtesy of Ian Guttridge. Upper class seats on secondary lines are grubbier and in a worse state of repair, but still comfortable. 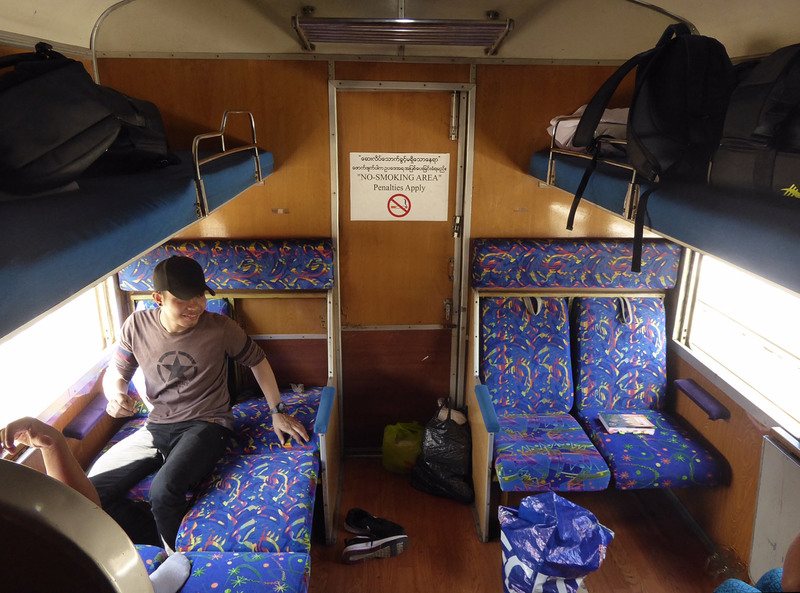 This is Upper class on the Slow Train from Shwenyaung (Inle Lake) to Thazi. First class is almost identical to Ordinary class, with basic wooden seats but with a padded leatherette seat bottom. For the first half hour, this padding seems to make the extra cost worthwhile. After that, you wonder if the Ordinary class wooden seats would be less sweaty in the heat... First class is only available on a few trains. 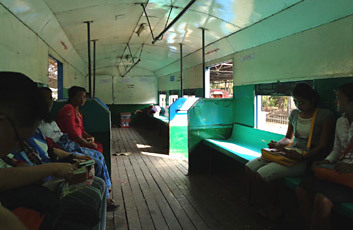 First class car, Mandalay-Lashio train. 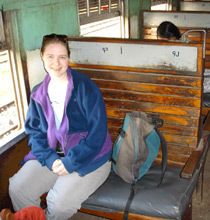 Ordinary class has basic wooden seats, and is perfectly acceptable for many journeys such as Mandalay to Pyin Oo Lwin or Hsipaw. The seats are numbered on the back (in Burmese numerals) and every passenger has a specific seat number written on their ticket, so there's no overcrowding or scrum for seats. Just watch out for the local produce stacked all over the floor! 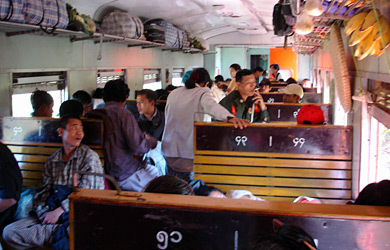 Ordinary class on the Mandalay - Lashio train. 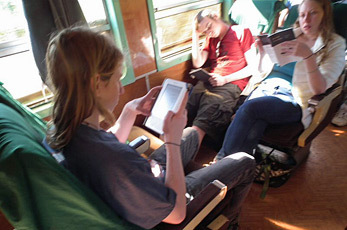 Upper class sleeping-cars operate on Rangoon-Mandalay trains 3 & 4 and on the Rangoon to Bagan overnight train, as well as in some Mandalay-Myitkyina trains, usually just one sleeping-car per train. Sleeping-cars come in two varieties, the standard sleeper with conventional side corridor and 4-berth and 2-berth compartments, and the less common special sleeper which has several totally separate full-width compartments each with 4 longitudinal berths a toilet and entrance door, but no access through the train. The Rangoon-Bagan train has the standard sleeper type, train 5 & 6 Rangoon-Mandalay has sometimes been reported as having standard sleepers and sometimes special sleepers. Train 3 & 4 has the standard type. A pillow, sheet and light blanket are provided, but it gets very cold at night so make sure that you have socks, a jumper and a fleece with you. 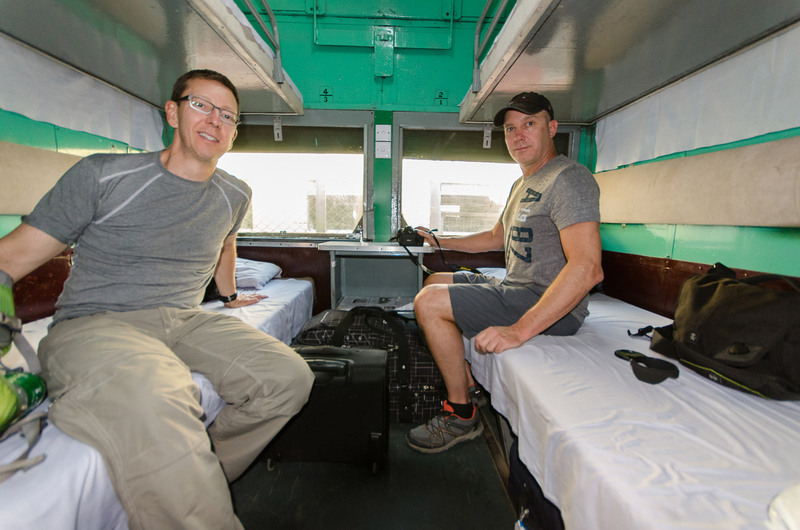 It's a noisy and bumpy ride, so you will snooze rather than sleep, but it's good to be able to lie down on a flat bed in a safely locked compartment on the great adventure of crossing Burma by train. There's a ceiling fan and the windows open for ventilation or reflection-free photography. More photos & feedback is always appreciated. 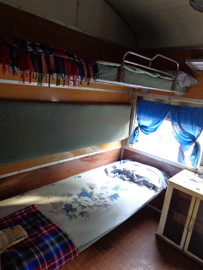 The standard sleeping-car as used on the Rangoon-Bagan overnight train and trains 3 & 4 Rangoon-Mandalay has four largish 4-berth compartments and two smaller 2-berth compartments, opening off a corridor running down the side of the car and giving access to the rest of the train. There are western-style toilets and a washbasin at the end of the corridor, usually kept pretty clean, but bring your own toilet paper. Upper class sleeping-car on train 4 from Mandalay to Rangoon, of the standard type with 2-berth & 4-berth compartments opening off a side corridor. Above left, a 4-berth compartment with 2 upper and 2 lower berths, click for larger photo. The 2-berth compartments have one upper & one lower berth. Some cars like this one retain the older aircraft-cockpit-green approach to interior décor. Photos courtesy of Michael Walker. Upper class sleeping-car of the same type, but some cars have been nicely refurbished with smart varnished wood panelling... Above left, a 4-berth compartment in a standard sleeping-car on the Rangoon-Bagan train, photo courtesy of Ian Guttridge. Above centre, the corridor along one side of such a car. 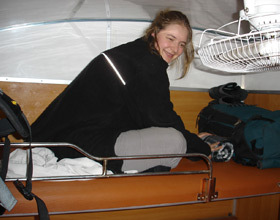 Above right, my wife Nicolette on the top bunk of a 2-berth compartment on a train from Thazi to Rangoon. These 'special' sleepers have an unconventional layout: A special sleeping-car is divided into four separate completely self-contained compartments, each taking up the full width of the car, each with its own entrance vestibule, its own toilet and seat/berth area with 4 berths. There is no corridor and no access between compartments or from your compartment to the rest of the train, so travellers in special sleepers cannot use the restaurant car (though meal orders may be taken and delivered to you during station stops). 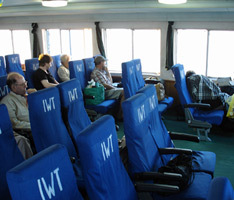 In the seat/berth area, a pair of wide upholstered armchairs face each other by the window on each side of the car. At night, the seats pull together to form a wide lower berth. The upper berths are fixed in position above the seats. A special sleeper from Rangoon to Bagan. 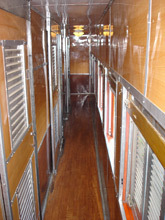 Pictured above right, a 4-berth special sleeper compartment on train 62, click here for larger photo. The photographer is standing in the compartment entrance vestibule, which has entrance doors on both sides of the car. The door to the toilet is behind him. The berths are longitudinal, along the coach sides. The compartment takes up the full width of the car, there is no access to the rest of the train or car either through the end wall in the background of the photo, or through the wall behind the photographer, other than the door into the toilet. Photos courtesy of Martin Stonebridge & Jeremy Szabosan. 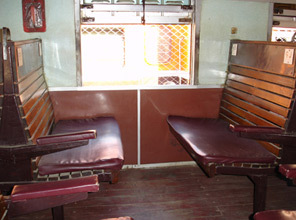 Pictured left is photo of another special sleeper compartment, The two face-to-face seats pull together to form the lower berth. If the camera panned to the left slightly you'd see the other pair of seats with an upper berth above them, a mirror image of the seats & upper berth you can see here. The photo is taken standing in the compartment's private vestibule, looking towards the back of the train, with the exit doors out of shot to left & right and the door to the small private toilet behind the camera. You can see there's a blank wall, no corridor or access to the rest of the train. Behind the camera is another wall, with a store cupboard & door to a toilet cubicle, but no access through the train that way either. 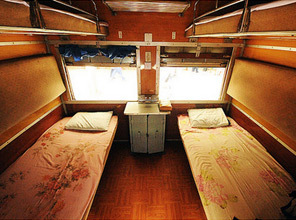 The sleeping-car is divided into four such compartments, each with 4 berths. Photo courtesy of Bas Linders. Your luggage goes with you onto the train, you put it on the overhead racks, or at the end of the car. For all practical purposes you can take what you like, backpack, suitcase, whatever. It's not a problem and of course you can access to your bags throughout the journey. Most mainline trains can take bicycles, carried in the baggage van for an extra fee. Just ask at the station. 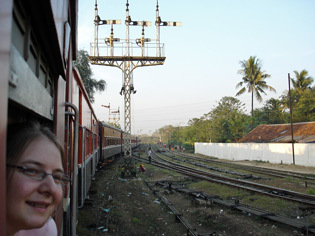 Traveller Astrid reports: "We took the train from Bago to Yangon and had our bicycles with us. Our bicycles got a tag and as soon as the train arrived the guys from the train station pushed our bicycles to the baggage compartment. We paid an extra fee for them. I suppose the proceeding for extra large baggage is the same. When we arrived in Yangon they unloaded our bicycles. No problem at all to transport them. We met other travellers who did the same for longer distances with no issues." 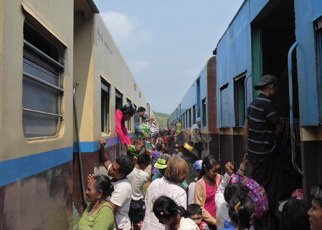 Until 2014, foreigners had to pay higher train fares than Burmese citizens, in US dollars. However, from 1 April 2014 visitors now pay the same fares as Burmese citizens, and in local currency (kyat). This makes train travel even cheaper, though it wasn't expensive before. Feedback and any info on the 'new' locals-rate fares would be appreciated, especially a photo of any new fares posters. Children under 3 years old travel free, children under 10 pay half fare. It's usually easy enough to buy in person at the station when you get to Burma. Booking only opens a few days before departure, and tickets are hand-written - Myanmar Railways don't even have a website! However, 12Go.Asia have now made it easy to order Burmese train tickets online. If you are sure of your dates they are the best way to order train tickets, especially if you want a sleeper as these can be in short supply. 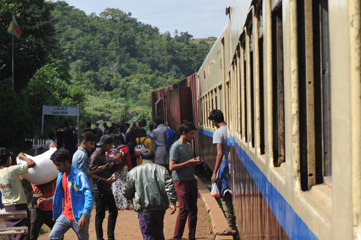 Update: It's recently been reported that in high tourist season an agency has been buying up blocks of sleeper berths on trains departing Rangoon in order to resell them. I don't know if it's one of 12go's local suppliers that is doing it, but using 12Go.Asia may be the wisest option to secure berths as you may not find any berths left if you wait to buy the station. 12Go.Asia are a reliable agency with a mission to make it easy to book trains, buses, ferries & planes online across Southeast Asia. They get very good reviews and can be used with confidence. You can order several months ahead if you like. They have the most popular train routes listed, but not yet every city or route as they have only just started selling tickets in Burma. They charge the price you see on their site - the Myanmar Railways fare with a reasonable mark-up - plus a dollar or two credit card payment fee. Please realise that this is not 'live' online booking, nor will you get an e-ticket. Myanmar Railways don't have any computer systems, they issue hand-written paper tickets and reservations open only a few days before departure. 12Go.Asia simply allows you to place an online order with them in advance, they then secure your tickets through a ground agent as soon as reservations open a few days before your travel date, then they either deliver them to your hotel or you can collect them. Exotic Myanmar Travels & Tours, www.exoticmyanmartravel.com. Exotic Myanmar have offices in Rangoon, Bagan, Mandalay & Inle Lake so can arrange tickets starting at all those locations. For example, they can secure an upper class sleeper ticket from Rangoon to Bagan or Mandalay or vice versa for a $25 charge. 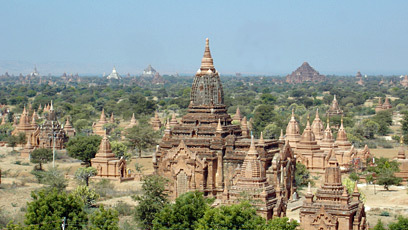 Myanmar Tour East, www.myanmartoureast.com - can arrange tickets starting from Rangoon. Go-Myanmar: You can also try www.go-myanmar.com for tickets starting in Rangoon. Pre-booking is no bad thing if you want a sleeper, as these are in relatively short supply. These agencies will buy your tickets on your behalf and have them delivered to your hotel for a nominal fee. If they ask you to send them a scan of your passport, this is quite normal. I have not used either agency myself, but Exotic Myanmar Travels & Tours has so far had at several very positive reviews. Feedback is always appreciated! You can buy train tickets in person at the station ticket office, it's easy. Reservations are not computerised, but based on hand-written manual reservation lists, so bookings can only be made at the station where your journey starts, not for journeys starting elsewhere. Every main station has a clear information board showing train times in English, and sometimes fares. Upper class bookings open 3 days in advance. Ordinary class bookings open just one day in advance. You can't buy tickets before bookings open. At some smaller stations you may be told to come back and buy a ticket just before departure. Apart from the train times & fares boards there are relatively few signs in English, but don't worry - just ask at the first available ticket window and as a foreigner you will normally be invited inside the ticket office (!) and told to sit down while someone is called to help you. You will need the names, nationality and passport number of each passenger as these will be written on your ticket. Tickets are hand-written. I'd recommend buying your ticket at least the day before departure if you can, but it's usually not difficult for a foreigner to secure a Upper class or ordinary class seat on the day of departure. All passengers get a reserved seat, the coach & seat numbers will be written on the ticket. Sleepers are in short supply on the main Rangoon to Mandalay route as there's only one sleeping-car per train, so book a day or two ahead if you can, or order in advance. But you're unlikely to have any trouble getting a sleeper on the direct train from Rangoon to Bagan even on the day of departure. To buy train tickets in Rangoon on the day of travel itself, go to the station. Tickets for trains leaving the same day are sold at the station. Take your passport and enter the station by the right-hand main entrance and for tickets to Mandalay or Bagan look for the first ticket window on the left. You'll find a money changer and several ATMs at the station if you need them, as well as food kiosks and a cafe. To buy train tickets in Rangoon 1-3 days before travel, go to the Advance Booking Office. Take your passport, and go to the Advance Booking Office which is not in the station itself but in Bogyoke Aung San road on the south side of the tracks, opposite the Sakura Tower & 33rd street, and diagonally opposite the Traders Hotel. Look for the entrance sign shown in the photo below. It is open daily 07:00-15:00. It looks more like a farmyard than a reservations office! Walk off the main road, 30m down the track into the booking hall proper, and you'll see a row of about 10 ticket windows. 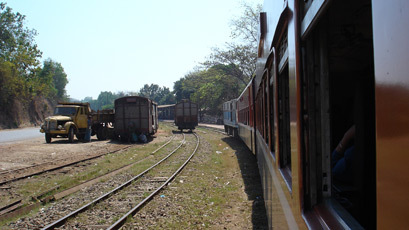 The window for booking trains from Rangoon to Mandalay is the first one on the left. 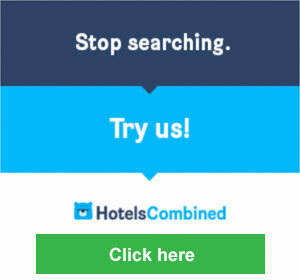 You may also be able to book train tickets through your hotel. In Mandalay, to buy train tickets go to the ticket office on the first floor of the station, above the tracks. English-language information boards: All main Burmese stations have English-language information boards showing timetables & fares for foreigners, like this. Courtesy Alex Diment. 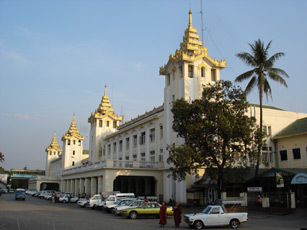 Rangoon station. Surprisingly, Rangoon's impressive station building is on the far (north) side of the tracks from the city centre. But don't go there to buy tickets! 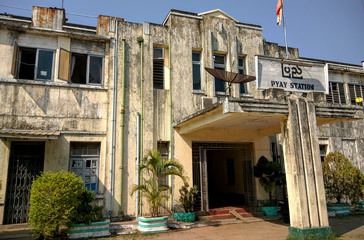 Entrance to Rangoon advance booking office on Bogyoke Aung San Road, on the southern (city centre) side of the tracks. At first sight more like a farmyard than a booking office, but look for this sign! Inside Rangoon advance booking office on Bogyoke Aung San Road. The far left window is the one for tickets to Mandalay or Bagan. Booking opens 3 days before departure. Feedback would be appreciated! Train tickets in Burma are hand-written! This is a 2014 ticket, you can see that payment is now in kyats, even for foreigners. Photo courtesy of Ioannis Karagiannis. Taking a river steamer along the Irrawaddy is perhaps the best way to transfer between Mandalay & Bagan. 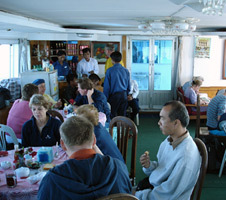 The Mandalay-Bagan express ferry is a wonderful way to travel, revealing Burmese life on and along the river. There are now 4 ferries: A twice-weekly slow ferry mainly for locals, the original daily Shwekeinnery express ferry for tourists, the competing MGRG express ferry also aimed at tourists, and an irregular express ferry Malikha. If you want the Orient Express 4-night luxury option, see the Road to Mandalay section below. Shwekeinnery express ferry = Daily Mandalay-Bagan express ferry Shwe Keinnery, highly recommended, fare US$35 if bought direct, US$40 bought through your hotel. Just ask at your hotel reception, although the website for this ferry no longer works. MGRG = MGRG Express Ferry, fare $45 per person, also recommended, see www.mgrgexpress.com. 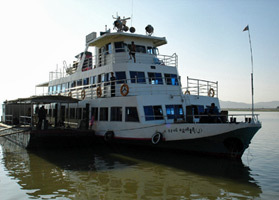 In Mandalay this ferry uses the MGRG jetty, see their site. Malikha express ferry (not shown here) = Mandalay-Bagan express ferry Malikha, fare $43, runs on certain dates advertised a month in advance at www.myanmarrivercruises.com. Local ferry = Inland Water Transport (IWT) slow local ferry with cabins, Mandalay-Bagan 18,000 kyat (about $18) per person, please double-check days & times when you're in Burma, feedback appreciated. You can buy a ticket on the boat or at the ticket office. IWT now has a website, www.iwt.gov.mm. www.myanmarrivercruises.com also seem to run an $80 deluxe ferry on certain dates. Rainy season: Some of these ferries - especially the tourist ones - may not run in the rainy season from June to October, so check with the operator. How to buy tickets: Ferry tickets for any of these ferries can be booked through your hotel or via a travel agency, or through the MTT (government tourist information) offices in major towns (there's an MTT office at Mandalay station or in Rangoon near the Sule Paya) or at Inland Water Transport (IWT) offices. To book the MGRG ferry, see www.mgrgexpress.com. 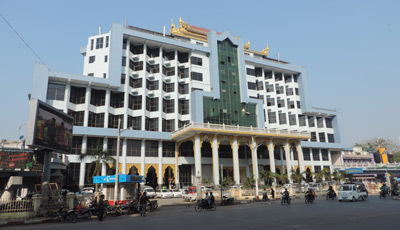 In Mandalay, the IWT office is located on 35th Street, a few hundred metres from the river on the left hand side looking towards the river. Ideally, buy a ticket the day before, but it's possible to buy tickets on the morning of departure at the boat, make sure you arrive before 05:00 to be sure of a place. If you have any feedback from travelling on these ferries, please e-mail me. All passenger get a reclining seat on the lower deck. There is a bar and café on the upper deck. 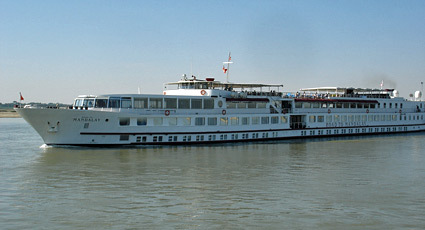 A luxury river cruiser plies the Irrawaddy between Mandalay and Bagan, offering 3 or 4 night one-way and 7-night return river cruises between Mandalay and Bagan. She's run by Belmond, who also operate the famous Venice Simplon-Orient-Express & Eastern & Oriental Express. The Road to Mandalay also runs occasional 11 night trips covering Bhamo in the North. Originally built in 1964 as the Nederland, she cruised the Rhine Valley for 30 years before being shipped to Burma in 1995, where she was renamed The Road to Mandalay after Rudyard Kipling's poem. She has just 56 cabins, all with windows. A 3-night luxury Irrawaddy cruise from Mandalay to Bagan leaving on most Wednesdays costs around £1,640 per person, including private cabin, restaurant meals, tours and transfers. She's now been joined by a second vessel, the Orcaella, which operates cruises in both directions between Rangoon and Bagan, taking 9 days/8 nights northbound from around £3,600 per person.. Many visitors take a ride on Rangoon's circle line, a rickety train that gives a great flavour of local life and is the closest thing Rangoon has to a metro. Circle trains run every 30 minutes during daylight hours, it takes around 3h30 to do the whole circuit. You simply buy a ticket for 200 kyat (£0.14 or $0.20) from the little office on platform 6/7 at Rangoon main station and hop on the next train. Some trains make the whole circuit, some terminate before completing the circle, so you need to switch trains. It's reported there most circle line trains may now be ex-Japanese Railways diesel trains with air-conditioning, but a few older trains like those shown below remain. Feedback appreciated. Latest reports suggest foreigners are directed to a special kiosk at Rangoon station to pay 1,200 kyat ($1.20) for a circle line ticket, whilst locals pay 100 kyat. At smaller stations, there is no such kiosk and all passengers pay 100 kyat. Feedback appreciated. There are no regular passenger shipping services from Burma, and overland travel between Burma and India or China has is either difficult or impossible. That's because the borders, and often the whole border regions, are generally closed to foreigners. Some regions are also dangerous because of political unrest. 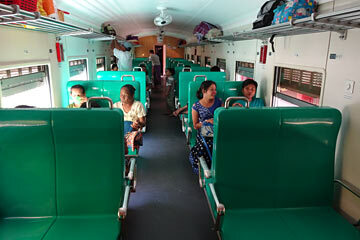 It is now possible to travel between Thailand and Burma overland using buses and the odd train. It's a real adventure, though remoter parts of Thailand and Burma not usually visited by tourists. I am very grateful for the help of traveller Alistair Weaver in compiling this section and reporting on the experience. There are three main border crossings between Thailand and Myanmar which are open to tourists, do not require a permit and allow onward overland travel to all other parts of unrestricted Myanmar. You will need to get hold of a Myanmar visa before travelling, they cannot be bought at the Burmese border - you can order an e-visa online which is now accepted for entry at three land borders with Thailand including Myawaddy & Kawthaung, see http://evisa.moip.gov.mm. Option 1 via Mae Sot (Thailand) and Myawaddy (Burma). This is the most popular. You take a night bus from Bangkok (Morchit bus terminal) to Mae Sot which drops you at the border in time for breakfast before walking over the border to Myawaddy on the Burmese side - you can check bus times at 12go.asia, although you may have to buy a ticket locally. Onward transport is then easily negotiated locally from Myawaddy to Mawlamyine and Hpa-An. A new fast road opened in 2015 and Myawaddy to Hpa An now takes as little as 4 hours. Minivans cost around $10 per person and can be easily arranged at the border (westbound) or in the return direction at many guest houses in Mawlamyine or Hpa-An eastbound. See above for trains between Moulmein and Rangoon. Option 2, via Ban Phunamron (Thailand) and Htee Kee (Burma). Details of this route are given below, courtesy of traveller Alistair Weaver. It leads you to Dawei which is currently unspoilt by tourism and boasts some very beautiful empty beaches. Onward travel from Dawei is slow, so this route is less popular. Option 3, via Ranong and Kawthaung. This is a short 15 minute boat ride and thanks to the number of people doing day trips from Thailand for visa runs is a simple straightforward process. It is detailed in most guidebooks. 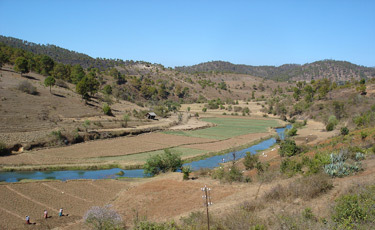 Onward travel north from Kawthaung is possible by boat or bus. Step 1, travel from Bangkok to Kanchanaburi by train over the infamous Death Railway, see the Bridge on the River Kwai page for train times, fares & how to buy tickets. You can just turn up and buy a train ticket for 100 baht on the day, it cannot sell out. Minivans also leave frequently from Bangkok and take 2 hours, although it's much nicer and more of far more historical interest to take the train. 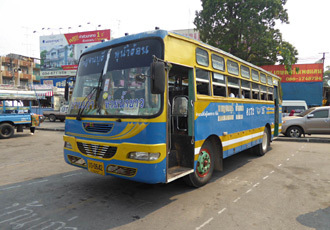 Step 2, Kanchanaburi to Ban Phunamron: Busses and minivans leave from the main Kanchanaburi bus station. With your back to the 7-11 shop the bus stand for Ban Phunamron is on the left hand side. Minivans leave at 06:00, 07:20, 09:00, 11:00, 12:00, 14:30, 16:20, 18:00. There is also a bus at 10:30. the minivan costs 100 baht and takes 1 hour, the bus costs 70baht and takes 90 minutes. Both drop you right in front of the border post. Walk out of Thailand. Step 3, from Ban Phunamron to Htee Kee (6kms of no man's land): There are two Thai restaurants the other side of the Thai border post. It is most likely you will be approached and offered onward transportation to Dawei for 800 baht. It would be prudent to accept this and is difficult to negotiate as they have to pay unofficial tolls to use the road on a per-passenger basis. Being taken directly to Dawei will include the relevant stop at Myanmar customs. If it is not possible to organise transportation you will have to hitch a ride for the 6km to Htee Kee. This is not difficult as there is a constant stream of pick up trucks importing Thai goods. They often stop just across the border to pick up locals. If this not possible stand at the side of the road, hold your hand at 135 degrees (as though walking a dog) and waggle your fingers - holding your thumb up as in Europe to hitchhike does not work in Asia! Prices range from free to 100 baht. 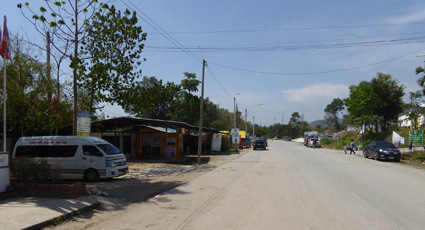 Step 4, Htee Kee to Dawei: If you were able to organise transport at Ban Phunamron this is merely a stop to get your visa checked and passport stamped. If not once you have gone through immigration which is in the concrete building on the right hand side head to where all of the vehicles are parked. There are frequent minivans from here to Dawei for 20,000 kyat. They will also accept Baht or Dollars as long as they are in mint condition. The journey to Dawei is 5 hours. Step 5, for trains between Dawei, Moulmein, Kyaikto, Bago & Rangoon, see the section above. Step 1, for trains between Rangoon, Bago, Kyaikto, Moulmein & Dawei, see the section above. Step 2, from Dawei to Htee Kee: Minivans leave from the minivan station in Dawei which is just behind the local bus station. There are a number of competing companies with vans leaving between 06:30 and 08:00. It's not clear if there are later vans, but you need to leave early. 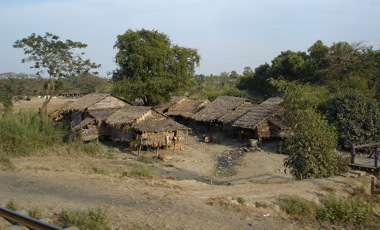 Step 3, from Htee Kee to Ban Phunamron: Myanmar immigration is in the concrete building on the hill to the left of the 'village'. Once you have done this you will need to hitch a ride to the Thai border. Empty pickup trucks are bound for Thailand, full ones are bound for Myanmar. As you leave immigration there is a road in the distance leading up a hill on the left to what looks like a petrol station with a green roof. This is the road to Thailand. Stand at the side of the road and hold your hand at 135 degrees (as though walking a dog) and waggle your fingers - holding your thumb up as in Europe to hitchhike does not work in Asia. Prices range from free to 100 baht. Step 4, from Ban Phunamron to Kanchanaburi: Your lift will drop you at the Thai border. Cross into Thailand. Minivans leave from under the tree about 100m down the road on the left. They run at 06:00, 07:20, 11:00 and 14:30, take one hour and cost 100 baht dropping you at Kanchanaburi bus station. Step 5, for trains from Kanchanaburi to Bangkok see the Bridge on the River Kwai page for train times, fares & how to buy tickets. Or there are minivans taking 2 hours. 10:30 bus from Kanchanburi to Ban Phunamron, at Kan'buri bus station. Courtesy of Alistair Weaver. The Thai side of the border at Ban Phunamron with a minivan to Kanchanaburi on the left. Courtesy of Alistair Weaver. Traveller Alistair Weaver reports: "Whilst this route is not difficult it certainly isn't the seamless border crossing you get between the likes of Vietnam and Cambodia or Cambodia and Thailand. But I highly recommend it and the trip through the mountainous jungle region on the Burmese side of the border is stunning. The road is a dirt track for the first 4 hours although it is wide and mostly smooth. Border formalities were among the quickest and most relaxed I've come across. Including queuing time it took 3 minutes to leave Thailand and 5 minutes to enter Myanmar. It was even quicker on the return trip. Be sure to carry some clean Baht with you and crisp, as new dollars. You will need this to pay for your minivan to Dawei (kyat if you have it is ideal). Once in Dawei there are cash machines and money exchanges giving an excellent rate for the dollar. I cannot emphasise enough the need for them to be in perfect condition, I had 2 of my $100 notes rejected as they had previously been folded in half. I recommend starting as early as possible in either direction. Personally I left Kanchanburi at 10:30 and arrived into Dawei at 18:00. In the opposite direction I left Dawei at 08:00 and arrived in Kanchanaburi at 16:00. There are restaurants on either side of the Thai border which I recommend eating at as there is little in way of food on the Burmese side until you get to Dawei. Remember there is a half hour time difference between Thailand and Myanmar. 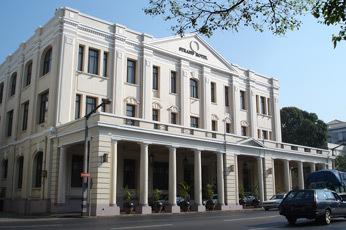 In Rangoon, the famous and fabulous Strand Hotel is Rangoon's equivalent of Singapore's Raffles, every bit as historic and almost as expensive, but actually (having stayed at both) even nicer. If you can't stretch to over $500 a night, at least have a cocktail in the bar! For a rather more down-to-Earth price, the Thamada Hotel is very near the station and easy walking distance from all of Yangon city centre, from about $85 per night, though there are many other good choices. ...A suite at the Strand. 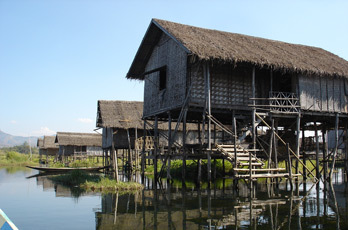 You'll need a good guidebook for Burma, and the Lonely Planet series is about the best there is. Highly recommended, although bear in mind that things are changing fast in Burma at the moment.